The other day I was again leafing through Bob Thomas’ fine biography of Walt Disney. Walt's remarkable imagination, shone through, as did his energy, optimism and decency. Walt Disney was a consummate Lean thinker. He practiced the fundamentals every day, including visual management, go see, leader standard work and strategy deployment. is contributions to visual management are legendary. He invented story-boarding, for example, the visual approach to movie-making -- and so much else. He practiced Go See every day. "I see myself as a little bee," he said. "I go from one area of the studio gathering pollen and sort of stimulate everybody." As a result he had a deep grasp of the situation and was able to articulate strategy in compelling ways. The creation of Disneyland in the early 1950's was a brilliant example of Strategy Deployment. 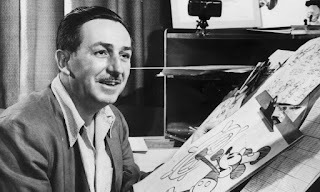 Walt began with a clear and compelling vision which he articulated through images (story-boards). His vision was informed by extensive travel and research into amusement parks around the world. He knew what worked and what didn't work. As ever, he grounded his vision in concrete experience. Then he put together an exemplary team, deployed elements of the plan to each team leader and checked progress with visual tools and leader standard work. A remarkable leader indeed. It strikes me, again, that what we call "Lean" is just good business. Great post. You can certainly sense and see elements of a Lean culture when you are at Walt Disney World in Orlando (my family and I visit at least twice per year). I'm impressed at how they are constantly experimenting and refining even the smallest processes at the parks to improve flow and enhance the customer experience. If you haven't read it, "Creating Magic" by Lee Cockerell (former EVP of Ops for Disney) is an excellent read and one of the better leadership books that I own.